Bedford OB chassis number 140900 was new to Richards Bros, Moylgrove, Cardiganin in August 1950 with Duple Vista body 49265. After being withdrawn from service it stood idle at the old Moylgrove depot for several years but this wonderful rebuild was returned from Cobus to Richards in October 2015. Seen here on a debut appearance at Cardigan’s Barley Saturday event. Looks good – sounds wonderful! ‘Looks good, sounds wonderful’ – a fair variation of a brewery advert from around forty years ago, and I’m sure the sight and sound of the reality ‘does you good’ as the advert continued. Thanks for posting. I have some (bought) views of the operator, but they don’t include this one. The livery is unusual, and may or may not appeal to some of our readers, but to the customers? Well, it was distinctive – no chance of confusion with a neighbouring or rival operator! Thanks for your input to this (and other) postings on this site Pete. There are colour photos of a number of vehicles, including a Titan, in this livery in my book. They generally suggest that the red was a a tad more maroon than here and that the blue was a shade towards air-force blue. 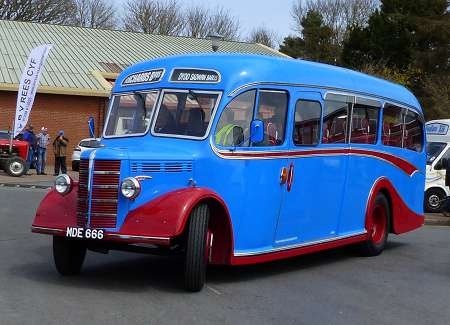 One of Tony Moyes’ photos of this very bus shows the shades that I remember seeing on my arrival in Cardigan however a Peter Yeomans’ shot of SB BDE 800C is much closer to the colours shown above. In general these colours were used from the very early days of Richards Bros but I suspect that maybe slight variations were tried over the years. MDE 666 has not stayed in the ownership of Richards since new to them. By 12/01 it had passed to Philip James of Blaenporth for preservation/restoration but after stripping the body down Mr James did no further work on it. In 6/09 he sold it to Cobus, who in turn sold it back to Richards after restoration.